Where do you want to go birding in Germany today? ....Site Descriptions: Frankfurt a.M. (Germany) area - by Richard Ives. two "clickable" maps of birding locations in the northern portion of Germany, along the seacoasts of the Helgolander Bucht and the Kieler Bucht. Clicking through on the many links to individual birding sites uncovers photos of the sites as well as more detailed maps. Isarstauseen, Ismaninger Speichersee, and Murnauer Moos. in the Rhineland, mainly between Frankfurt and the Dutch border (so far the major exceptions are Lower Havel, Garlitz, and Texel). The most recent trip is always at the top. A link to weekly trips by bicycle through an area of varied bird is also provided. a report about the area I live in when I met a birder from the States some years ago in the North of Germany, somewhere near a muddy place on a rainy, boring day. He was working in Hamburg for some month. On weekends he tried to see as many European species as possible. Suddenly it became exiting for me as well to search for species like Tree Pipit or Crested Lark. 1999 - by Stig Linander. Rügen is Germany's largest island. It is located in the Baltic Sea at 54.5°N, 13.5°E. The trip was a family holiday trip so birding activities were kept at a low level. Most of the birds mentioned below were just birds which I couldn't avoid noticing as they dropped by. During the week, I saw or heard 71 bird species which is more than I had expected with the low activity level in mind. presents (in German only) a great offering of interesting content for all bird-interested people. You can sharpen your skills with the exciting VoiceQuiz (www.vogelruf.de/quiz), read in the lexicon or anything else you might think of in context with birds. 25 July to 11 August 1994. By Gerard Joannes. The aim of this trip was mainly to visit places and I did not do much bird-watching. I nevertheless saw a few interesting things. July 1, 1995 - by Paul Rakow, Germany. This site is 70 km southeast of Berlin. Bohemia 19-23 April 1995 - by Brian Stone. This is a helpful and entertaining report of a trip through Germany and the Czech Republic. 1996 - by George Harris. 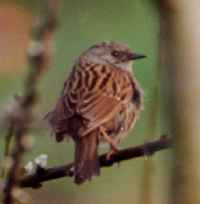 Following is a report of birds observed in Germany, May 30 thru June 24, 1996. Areas covered are within 40 miles of Bingen (Rheinland-Pfalz), except for a day trip to Neuschwanstein in S. Germany. Oxford, UK. I spent the first three weeks of July 1996 at Rostock and went birding on some evenings and at the weekends. There are a number of good areas accessible by public transport from Rostock; in particular a nature reserve near (just to the south west of) Warnemuende - accessible by s-bahn or bus - consisting of wet grassland and bushy regions, the reserve "Grosses Moor"- accessible by bus - a few miles further east, and "Schwarzes Moor" (sort of forest swamp) near Graal Mueritz - accessible by bus or train. Haynes Miller, Newton, MA, USA. Provides brief descriptions of six major German bird refuges: Steinhuder Meer, Meissendorf, Drömling, Rieselfelder, Münster, Wagbachniederung, and Kühkopf. Berlin on a general birdwatching trip with a friend from June 27th to July 10th 1998, staying in Spandau and hiring a car. Although icterine, grasshopper and marsh warblers were still singing, several of the more interesting passerines such as river warbler and thrush nightingale seemed to have fallen silent and were very difficult or impossible to locate. A visit to any of these sites in May would probably give a far greater variety of birds than we managed to locate. (Sweden), April 2-13, 1998 I write very briefly, mainly for the benefit of the North-American readers, from whom I have always got most plentiful comments and most beautiful compliments concerning my trip reports. For the European readers, I must tell that there is nothing outstanding here -- just common species. 3rd July, 1999, by Stig Linander. Rügen is Germany's largest island. The trip was a family holiday trip so birding activities were kept at a low level. Most of the birds mentioned below were just birds which I couldn't avoid noticing as they dropped by. During the week, I saw or heard 71 bird species which is more than I had expected with the low activity level in mind. April 29 - May 23, 2003, by Urs Geiser. This trip had two main purposes, neither of them birding: the Greece segment was to attend a professional conference in Dassia on the island of Corfu, and the vacation trip through the northern half of Germany was to visit the ancestral villages of my wife's family. Nevertheless, I managed to fit in quite a bit of birding, especially during the second part of the trip. birdingpal.com...>> A Birding Pal is not a paid guide, but someone who likes to help out of town visitors. You can become a Birding Pal today! Help someone to enjoy your local birding spots and find a pal to help you when you travel. Click here for German Birding Pals, or join to be a Birding Pal! If any birdwatcher is traveling or has to stay in the north of Germany you should give me a ring or send me a mail. I would really like to show you around and find the species you would like to see. I don't charge for having fun ! Of course sharing petrol is always nice but the most important thing is to help other birders. Especially because it suddenly becomes exciting to search for even rather common species. Lübeck is situated northeast of Hamburg, close to the Baltic Sea and at the former border to Eastern Germany. This region is rather interesting for a good variety of North-German species as it covers a great variety of different habitats. In late spring or early summer between 100 and 150 species can be seen within one day in the Luebeck area (radius 30km). Within a radius of 150 km another 50 species should be possible. In winter about 100 species still can be found within one or two days. Write to: ehlert.herfurth@t-online.de or phone: Tim Herfurth 0049 451 7060080 . Information on endemics and specialities is derived from Sibley & Monroe checklists and bird distribution lists in Thayer's Birder's Diary - Version 2.5. Speciality birds, while not endemic, are those that can only be found in three or less countries of Europe. Species printed in bold italic have only been sighted in Germany. Information on endangered birds is derived from the IUCN Red List, Birdlife International, and supporting data bases developed by Ian Patton, of Merlin Species Watcher. The endemic, endangered and speciality birds may be uncommon, extremely rare vagrants, may be extirpated in the country now or may only be present in migration. However, documented sightings of each species noted below have been made in Germany.